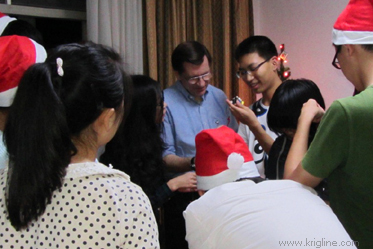 Christmas 2011 was our first Christmas at this apartment in Xiamen. We also went to Metro in late November to buy a Christmas tree (we had only a tiny in in Zhangzhou the previous year). 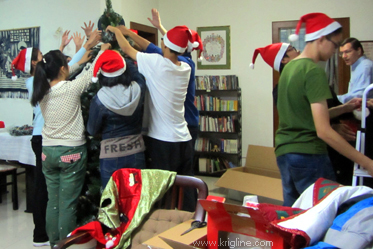 In fact, the "Metro" tree is the biggest we've ever had in China, and it was a lot of fun to put it together and decorate it! 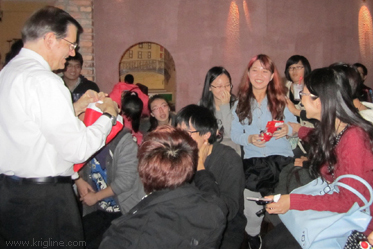 We also got to do other things with students, like sing on Gulangyu and hold a party a D'cups Coffee Bar. 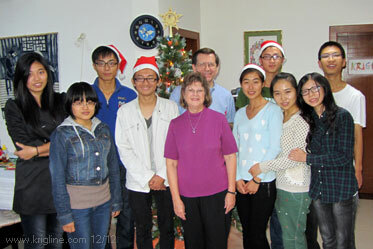 On the first Sunday of Advent, these special students got to help us decorate our apartment. Most had never decorated a Christmas tree before. They also got to enjoy American pancakes for the first time! 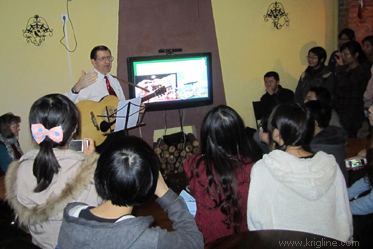 In mid-December, I was asked to help lead a Christmas music program on nearby Gulangyu island (in the historic Union Church building). 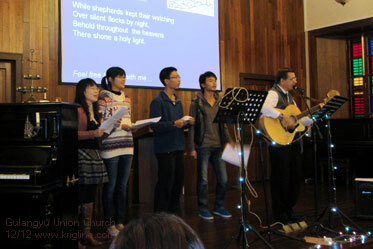 These students & friends volunteered to learn several songs so they could also participate. (Above left) We bought a new Christmas tree this year (the biggest we've ever had); here it is in the box, with three guys ready to help me put it together. (Above right) Once the unboxed tree looks like a tree, we hand out ornaments, often explaining their significance. (Bottom left) Vivian said the students looked like Charlie Brown's friends decorating their tree (we love watching Snoopy's Christmas each year). (Bottom right). 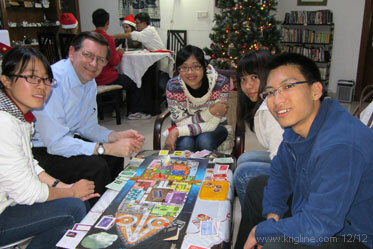 Other Advent parties include "board game night" and a chance to make personal greeting cards for friends (not shown). Each night, we take a break for refreshments and to light an Advent candle while reading about the historical Christmas story. Most of our guests have never heard it before, so their responses and wonder make the familiar events "ever new" to us too! 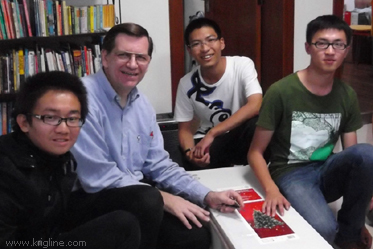 (Above) Every other university I've worked for in China has allowed us to throw a big party on campus for students. We couldn't get permission this year, but D'Cups--a local coffee bar--came to the rescue. We packed one wing with students who were interested in learning about the music and history of Christmas. We had a wonderful time, singing, sharing, and drawing names out of a stocking hat to give away prizes! I doubt that I'll find time to edit and post any more...until next year's celebration!